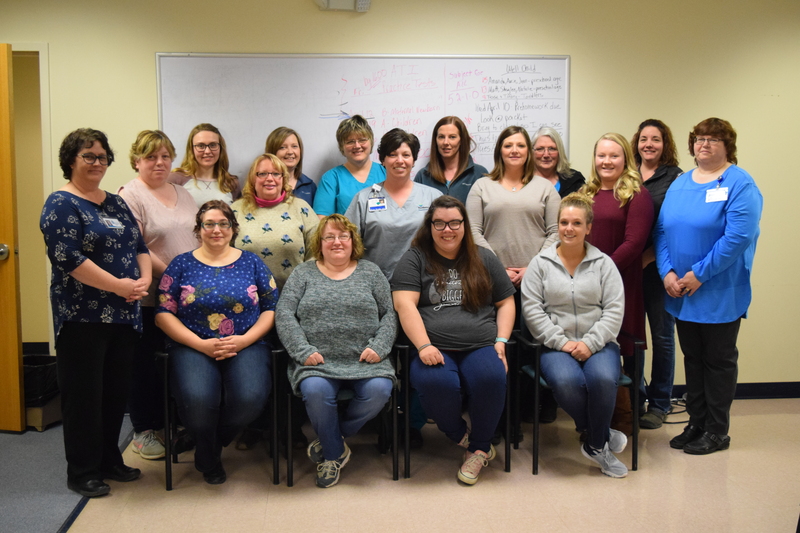 Houlton – In an attempt to fill a gap in the healthcare field in Aroostook and beyond, this spring NMCC launched a new program in Houlton, training Practical Nurses (PN’s). The brand new cohort currently has 15 students enrolled in the 45-week program based out of the Houlton Regional Hospital. NM’s new PN program is Houlton is the only offered by a public institution in the state and aims to fill a gap in Maine healthcare. Seated (left to right): Michelle Moore, Bobby Jo Ruffin, Katelyn Hammond, and Ashley St. Pierre. Middle Row: Tonia Shaw, Lynn Tuck, Cassie Carmichael, and Bailee Kingsbury. Back Row: Angela Davis RN BSN, Helena Cochran, Ellen Lincoln, Katherine DuBois, Amy Doughty, Miranda Swallow, Tonya Osnoe, Tonya Fitzpatrick, and Angela Bickford RN BSN.